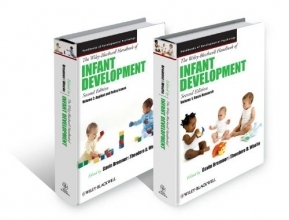 Now presented in two volumes, the second edition of The Wiley Blackwell Handbook of Infant Development reflects the breadth of new topics and vast empirical knowledge relating to infancy research that has emerged in recent years. Preface (Gavin Bremner and Theodore D. Wachs). Chapter 1: Historical Reflections on Intimacy (Alan Fogel, University of Utah). Part I: Basic perceptual and cognitive development. Chapter 2: Visual perception (Alan Slater, Washington Singer Laboratories, Patricia Riddell, University of Reading, Paul C. Quinn, University of Delaware, Olivier Pascalis, University of Sheffield, Kang Lee, University of Toronto, and David J. Kelly, University of Glasgow). Chapter 3: Auditory Development (Denis Burnham, University of Western Sydney, and Karen Mattock, Lancaster University). Chapter 4: Intermodal Perception and Selective Attention to Intersensory Redundancy: Implications for Typical Social Development and Autism (Lorraine E. Bahrick, Florida International University). Chapter 5: Action in Infancy Perspectives, Concepts, and Challenges (Ad Smitsman, Radboud University, and Daniela Corbetta, University of Tennessee). Chapter 6: Cognitive Development: Knowledge of the physical world (Gavin Bremner, Lancaster University). Chapter 7: Perceptual categorisation and concepts (David H. Rakison, Carnegie Mellon University). Chapter 8: Infant learning and memory (Carolyn Rovee Collier, Rutgers University, and Rachel Barr, Georgetown University). Chapter 9: Functional brain development during infancy (Mark H. Johnson, Birkbeck College, University of London). Part II: Social cognition, communication, and language. Chapter 10: Emerging self concept (Philippe Rochat, Emory University). Chapter 11: The Importance of Imitation for Theories of Social Cognitive Development (Andrew N. Meltzoff, University of Washington, and Rebecca A. Williamson, Georgia State University). Chapter 12: Engaging Minds in the first year: The developing awareness of attention and intention (Vasudevi Reddy, Portsmouth University). Chapter 13: Preverbal communication (Andrew Lock, Massey University, and Patricia Zukow Goldring, University of California, Los Angeles). Chapter 14: Early language (George Hollich, Purdue University). Part III: Social emotional development. Chapter 15: Parent infant interaction (Marc H. Bornstein, Eunice Kennedy Shriver National Institute of Child Health and Human Development, and Catherine S. Tamis LeMonda, New York University). Chapter 16: Attachment in infancy (Germán Posada and Garene Kaloustian, Purdue University). Chapter 17: Early social cognitive skills at play in toddlers peer interactions (Hildy Ross, University of Waterloo, Marcia Vickar, University of Waterloo, and Michal Perlman, University of Toronto). Chapter 18: Touch and physical contact during infancy: Discovering the richness of the forgotten sense (Dale M. Stack, Concordia University). Chapter 19: Emotion and its development in infancy (David C. Witherington, University of New Mexico, Joseph J. Campos, University of California, Berkeley, Jennifer A. Harriger, Cheryl Bryan, & Tessa E. Margett, University of New Mexico). Chapter 20: Temperament (Theodore D. Wachs, Purdue University, and John E. Bates, Indiana University Bloomington). Chapter 21: Culture and infancy (Charles M. Super and Sara Harkness, University of Connecticut). VOLUME II: APPLIED AND POLICY ISSUES. Chapter 1: Fetal development (Raye Ann deRegnier and Shivani Desai, Northwestern University Feinberg School of Medicine). Chapter 2: Infant nutrition (Maureen M. Black and Kristen M. Hurley, University of Maryland School of Medicine). Chapter 3: Health (Robert J. Karp, SUNY Downstate Medical Center). Chapter 4: Development of communication in children with sensory functional disabilities (Gunilla Preisler, University of Stockholm). Chapter 5: Growing up in poverty in developed countries (Jondou J. Chen, Nina Philipsen Hetzner, and Jeanne Brooks Gunn, Columbia University). Chapter 6: Infant Development in the Developing World (Patrice Engle, California Polytechnic State University). Chapter 7: Child abuse and neglect (Kelli Connell Carrick, University of Houston). Chapter 8: Effects of postnatal depression on mother infant interactions, and child development (Lynne Murray, Sarah Halligan and Peter Cooper, University of Reading). Chapter 9: Infant assessment (Susan P. Berger, Children s Memorial Hospital & Northwestern University, Feinberg School of Medicine, Joyce Hopkins, Illinois Institute of Technology, Hyo Bae, Illinois Institute of Technology, Bryce Hella, Illinois Institute of Technology, and Jennifer Strickland, Illinois Institute of Technology). Chapter 10: The Early Development of Autism Spectrum Disorders (Gregory S. Young and Sally Ozonoff, University of California, Davis). Chapter 11: Infant Psychosocial Disorders (Melissa R. Johnson, WakeMed Health and Hospitals & University of North Carolina Chapel Hill, Karen Appleyard, Duke University). Chapter 12: Genetic Disorders Associated with Intellectual Disability: An Early Development Perspective (Deborah J. Fidler, Colorado State University, Lisa Daunhauer, Colorado State University, David E. Most, Colorado State University, and Harvey Switzky, Northern Illinois University). Part IV: Intervention and policy issues. Chapter 13: Early intervention (Douglas R. Powell, Purdue University). Chapter 14: Childcare Research at the Dawn of a New Millennium: An update (Sarah L. Friedman, CNA, Edward Melhuish, Birkbeck, University of London, and Candace Hill, CNA). Chapter 15: Infancy research, policy, and practice (Marguerite Barratt and Erica Fener, The George Washington University).